Placing 1C-Bitrix24 in the Cloud4Y You get all the benefits of a boxed version of the product, which you lose when you use version Bitrix24, hosted in the cloud 1C. 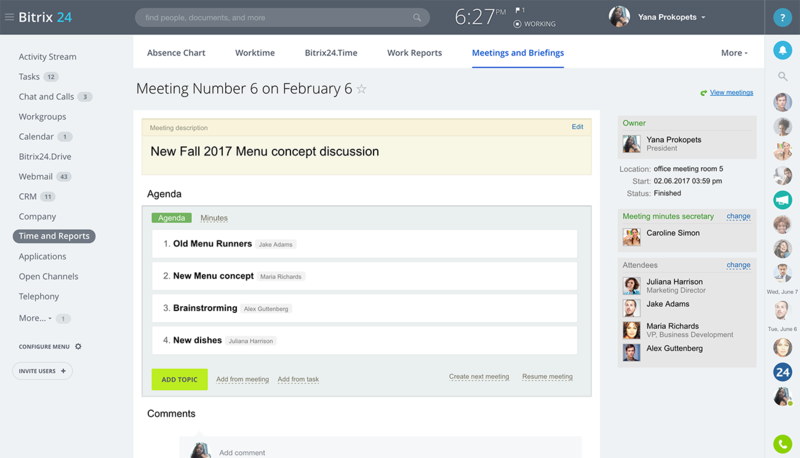 Work in 1C-Bitrix24 with pleasure - as a social network. Worked on the project together and discuss all in real time. 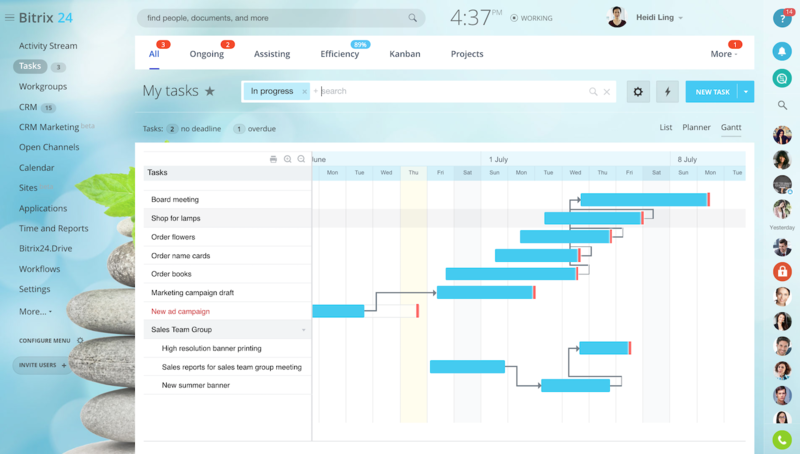 Use familiar tools for communication, task management, documents, working time and other services. All the tools you "at hand" - an interactive "Buzz". 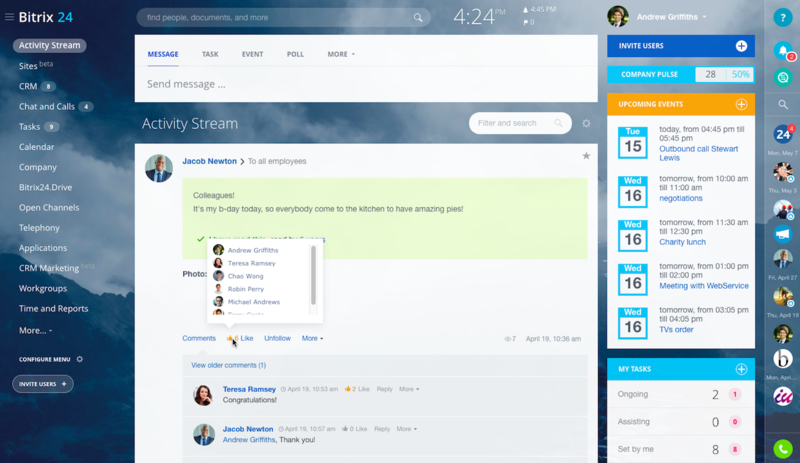 Invite a group of colleagues in the business chat communicate with them voice and video, write messages, edit the same document together. Contact with a colleague who is offline, - call him on his mobile fr om 1C-Bitrix24. 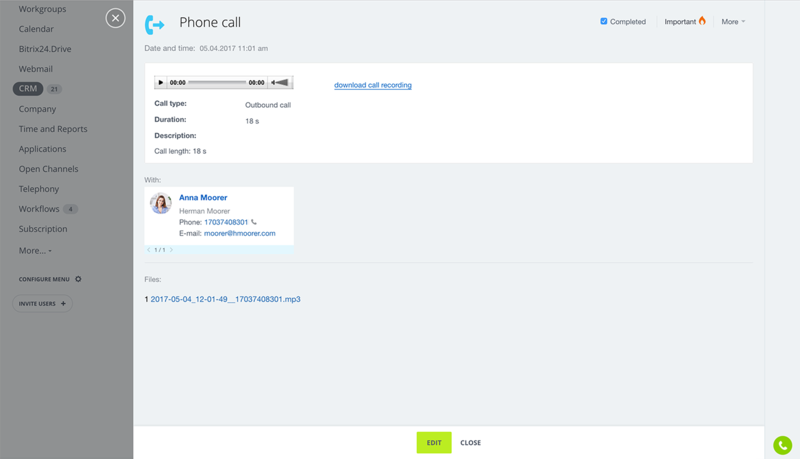 Call Clint regular phone directly from the CRM using the built-telephony. Work with partners to jointly Extranet - to secure and neutral territory. Connect "Bitrix24.Disk" and manage your work files to and from your computer, and right from the 1C-Bitrix24. Connect to your disk file folders and disks of groups give access to their colleagues and work with the files together. Share documents with colleagues, discuss them in "Buzz" for them to get inbound links to social networks and partners. Work with documents in 1C-Bitrix24 even in the absence of office software. Through external online services Google Docs and MS Office Online, you can open, view and edit directly on the portal any files of popular formats. Edit any documents on the portal with the help of "native" applications installed on your computer. The entire history of changes is saved, you can always restore the previous version of the document, and the document as desired easily will discover an inner search. 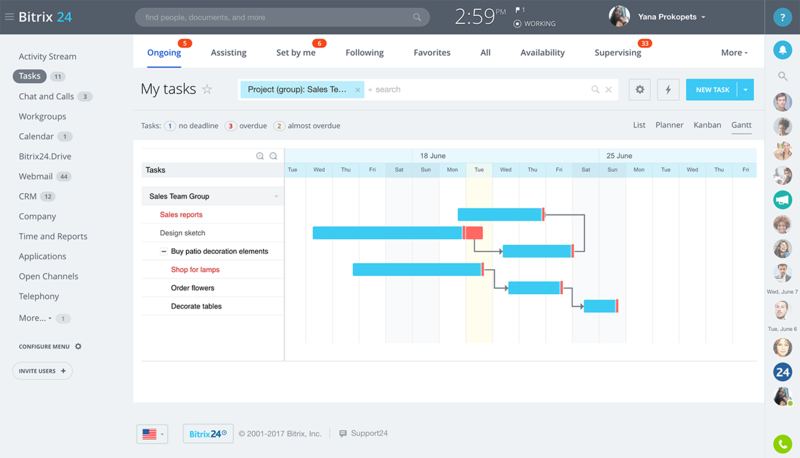 Turn on account of working hours 1C-Bitrix24 to improve discipline in the company. Employees will mark the beginning and end of the workday, breaks, absences, schedule tasks for the day. On the basis of these data formed to guide the report on working time. These reports will also take into account the time spent on tasks. Keep in your CRM database of contacts and companies with whom you collaborate. 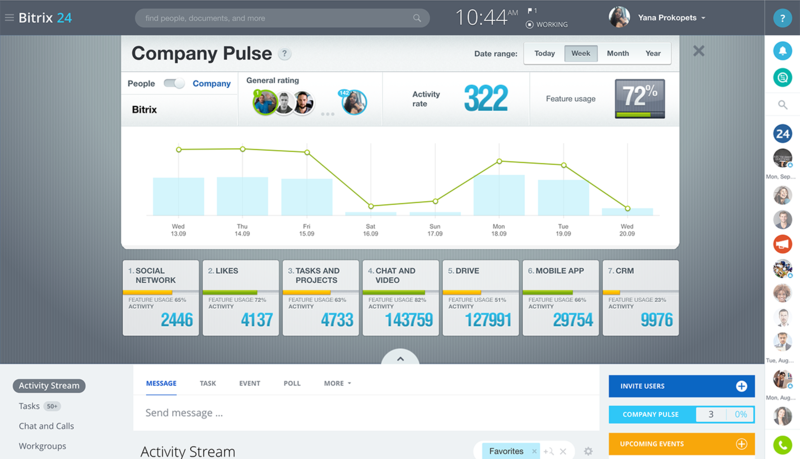 Manage leads and transactions from any device, including mobile. 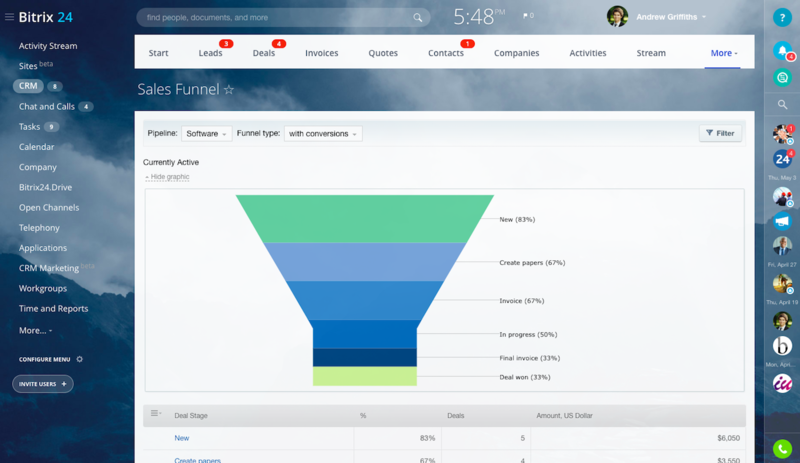 Capture all events (calls, letters, meetings), invoice customers, build reports and "sales funnel." 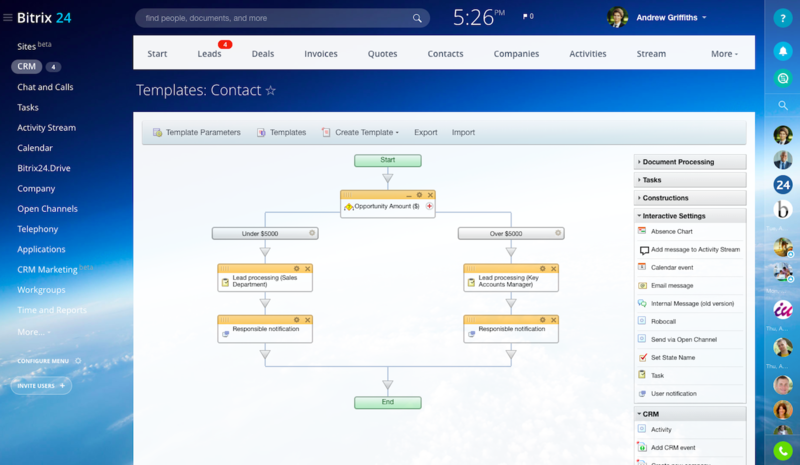 Plans to do without leaving the CRM. Create a task, use the business processes for the treatment of disabilities and deals, send letters and call customers directly from CRM to regular phones. Enable integration with "1C", and in your CRM is timeless catalog, "fresh" price list and correct data on the balance of merchandise. Integrate CRM with an online store, and your managers will conduct and "defraud" the transaction to a successful conclusion of most CRM. Tie any web form on your site 1C-Bitrix24, and data from this web form will be automatically sent to the CRM. 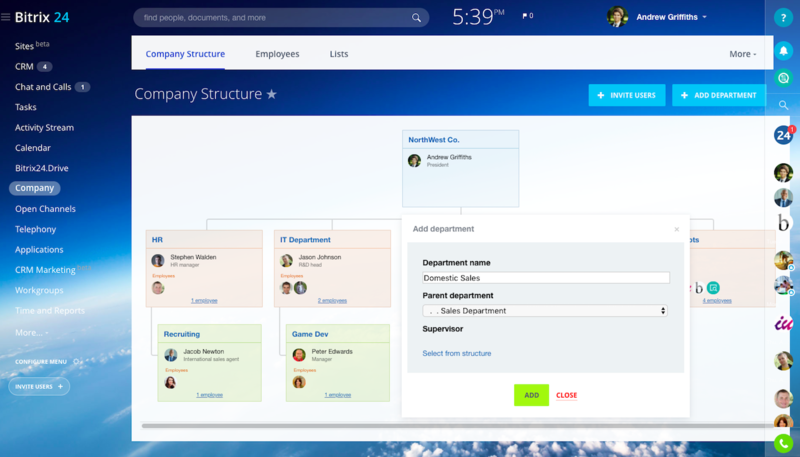 Manage company employee structure visually. Just drag the employee to another department, add new, change leader. Find out who is subject to the employee, get his quest quickly get all the data on his personal page, contact through the portal, now in the phone directory. 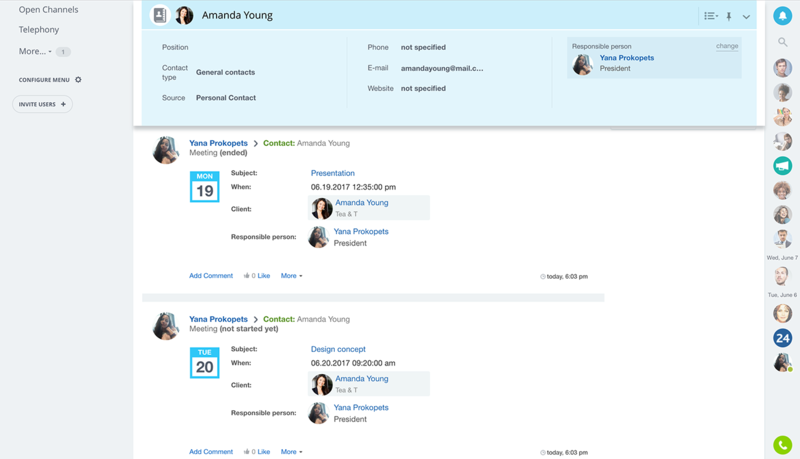 Synchronize contacts with mobile phone portal, MS Outlook and other applications to stay connected. 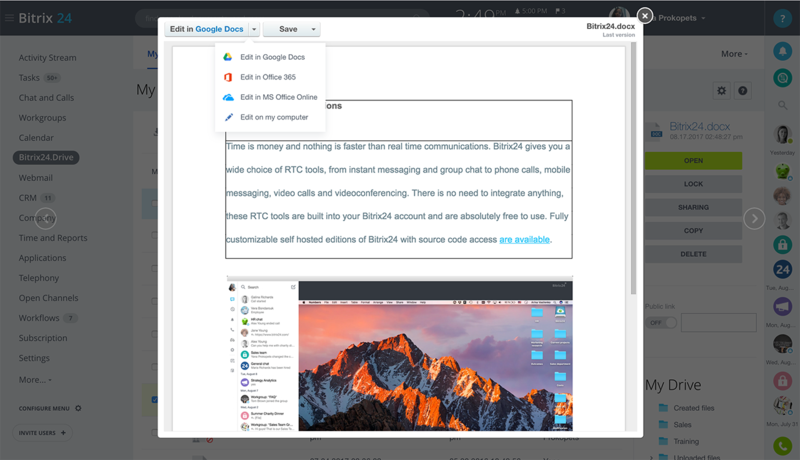 Install desktop application (Mac or Windows), to communicate with colleagues, even if the browser with 1C-Bitrix24 closed. 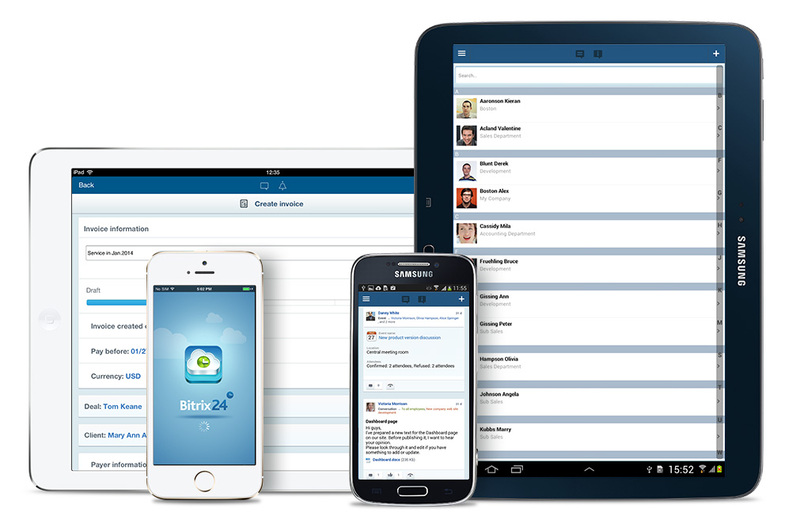 Communicate with colleagues: call them through 1C-Bitrix24 and on mobile phones, invite a group chat, including video, see the message history. Receive notification of the most important new developments in the "Buzz", husky and comments to them about the objectives and the status of their implementation. Connect from the desktop application "Bitrix24.Disk" and work with the files in the 1C-Bitrix24 from any device. 1C-Bitrix24 - a safe product to work together. Your data will be stored securely, and once you get access to them in accordance with the system of user rights. Your employees can easily open 1C-Bitrix24 in cafes, shopping centers, airports - in unprotected environments, connecting via WiFi or mobile phone. Attackers not intercept their passwords to use for their own purposes. All connections to the 1C-Bitrix24 made using certificate SSL, which ensures the security of your corporate information and protect passwords. 1C-Bitrix24 provides maximum protection against a variety of security threats. Proactive Filter (WAF - Web Application Firewal) protects against most of the known attacks on web applications. Why your company needs 1C-Bitrix24? Special offers are available. Ask your promotions to our managers. What are the minimum requirements for 1C-Bitrix24? We have already taken care of how to save your time - to set 1C-Bitrix24 we set up ready-made template that can be used to create a virtual server for "Bitrix24." Detailed instructions on how to expand 1C-Bitrix24 is available in our knowledge Base. Portal created on the basis of 1C-Bitrix24, supports all modern browsers: Internet Explorer, Mozilla Firefox, Opera, Safari, Google Chrome. Built-in visual HTML editor product is compatible with all popular browsers: Internet Explorer 7.0 or higher, Mozilla FireFox 3.6 or higher, Google Chrome, Opera, Safari. Can I test the 1C-Bitrix24? Of course you can, you can get a free test access and evaluate the work 1C-Bitrix24, as well as the quality of services Cloud4Y. Any questions relating to the work 1C-Bitrix24 You can ask our experts.